A small hole in the roof lets through a ray of sunlight, shining on the wall or on the floor. 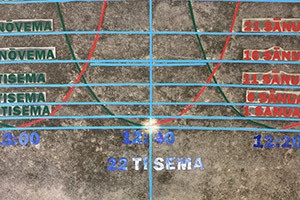 The actual time and date can be read from the intersections of the horizontal blue lines (date) and vertical red or green lines (time), by matching the same colours as for the labels. The green lines are used in spring, the red in autumn. They differ because of the variable speed of the sun over the year, known as the equation of time. 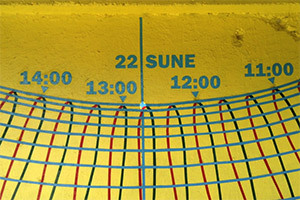 The sundial is on the northern wall of the shop, facing the public road, open for viewing any sunny day. Start of winter. Concerning temperature it may be never really winter in Tonga, but around 22 June the sun reaches its northernmost declination, stands only 45° above the northern horizon, casting its image close to the roof. Equinox. 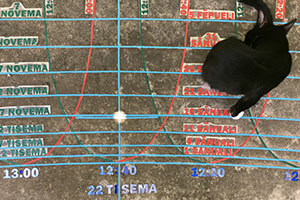 Around 21 March or 23 September the sun passes the equator. Only that day it describes a great circle in the sky, which translates into a straight line of the path of its image. All other days the paths are hyperbola. Tonga is situated in the tropics. 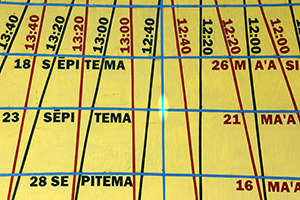 In Tongatapu the sun reaches the zenith on 15 January and 27 November. Start of summer. Around 22 December the sun reaches its southernmost declination, standing so high above the northern horizon, that in fact it culminates in the south, shining on the concrete slab. Due to the occurence of leap years the sun might be off by half a day from its designated blue date line. Also the solar declinations of, for example 15 February and 27 October, although drawn with the same line, are not exactly the same. In fact if one looks carefully then over the course of the day it can be seen that the sun will move up in autumn (February) and down in spring (October) away from the given date line. Tonga is normally 13 hours in front of Greenwich, and as such the times are labelled. Of course when backwards governments get it in their mind to enforce summertime, all will be off by 1 hour. Astronomy is known for its accurate measurements. But only if a measurement can be repeated again and again. In this case day after day. These are astronomical positions. In WGS84 system as used by maps it would be 175°19456 and 21°13738. Construction started in March 2005 by marking the places where the sun shone on particular days and hours; every week, every 15 minutes. By the end of 2005 enough points were obtained to measure their coordinates and put them in a theoretical model. Using the method of the least squares the optimal parameters could be found and the position of the wanted points calculated. Then the first half of 2006 was used to drill holes on these positions, put wires in between, and label them. 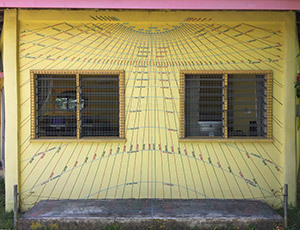 The work was largely to be repeated when the building was repainted in 2014.